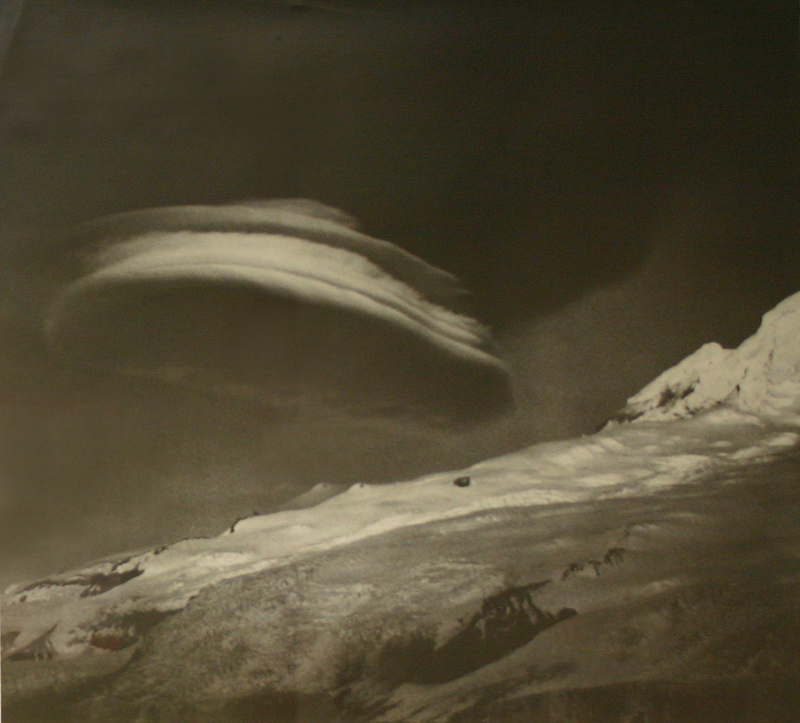 Blue tone photograph of Nature's Flying Saucer, taken at Heard Island in 1948. Signed in lower right corner with title and date in lower left corner. Special notes: Group exhibition. The story behind the picture: "It was a beautiful day down on Heard Island in the south Indian Ocean back in 1948. It is unusual to have fine weather in these sub-antarctic latitudes. This great white cloud formed around midday caused by a 60 knot turbulence above the 9005 ft high ice mountain of Big Ben which is a dormant volcano still breathing. Down at the base camp we had no wind at all. Throughout the afternoon, this beautiful cloud just hung there, constantly changing in form and colour yet never moving away from over the mountain that formed it. Later as the sun went down, this beautiful cloud changed in colour from yellow to crimson and pure gold, then to magenta against an almost mauve sky, but I didn't have the colour film in those days capable of recording it in the rapidly dimming light. It was a ghostly image in the cold light of the moon. Then it vanished and has never been seen again anywhere! This picture was circulated world-wide by Meteorology Bureaus as being the most perfect example ever recorded of the cloud form known as alto-cumulus­lenticularis, (lenticular cloud) and sometimes referred to as "wave cloud". The work itself was photographed with an old-time Graflex camera (1/4 plate) like early press photographers used. The picture is a blue-tone image which I made by the dye-coupler process which can no longer be reproduced on modern resin-coated papers. So, for two reasons my picture is unique." (Alan Campbell-Drury, 3 Sep 1987). 1 photograph : b&w. ; 42 x 60 cm.